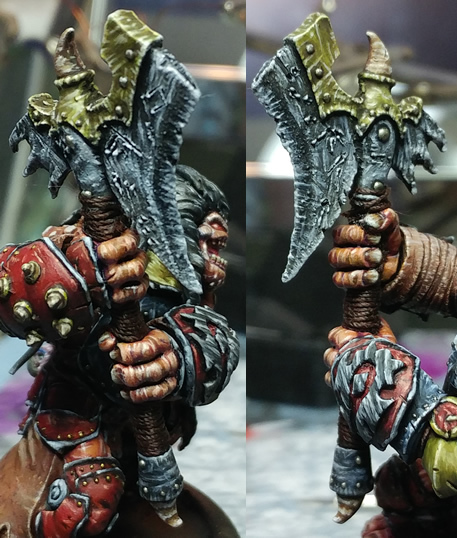 This is going to be the first post detailing how I created my Hordebloods Axer Blademaster. 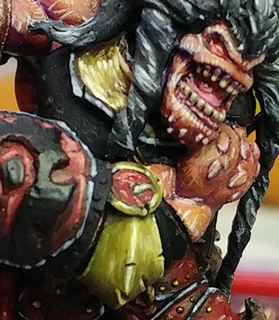 Today, I'll cover the painting stages, later you'll be able to read about basing him and after that I'll post a last post with the final photos. Got a chance to airbrush more and more smoothly, which I think has finally convinced me I want to get a second finer airbrush. Had a lot of fun making him, always cathartic to paint when life (work) gets busy. I picked up some Vallejo airbrush paints and while I still thinned them some, they worked better than thinning GW paints as I usually do. The base coat was pretty quick using the airbrush and I really like how it turned out. I tried going a little lighter, but it washed out. Decided those highlights would be best done with a brush. You'll notice that from the airbrush base, I've gone back in with some purples and shaded the crevices on his skin. This was something I'd first played with on my Ogre Sorcerer, but made more obvious on this model. To add a little more texture to his skin, I sponged on some browns VERY lightly. I'm not trying to paint his skin brown, just add to it some. You'll notice in further steps that I've also used light beige to add another highlight. 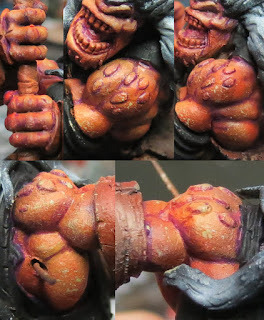 Just showing off start and finish, I've already written about painting leather in a standalone tutorial. I airbrushed this base as well, then followed these quick steps. Basically just lots of little lines on the edges of the wraps to suggest wear and tear. A dark brown wash over everything, then a darker brown wash between each wrap. A final highlight like the first step, but not as many as I started out with, that was more just an underlight. 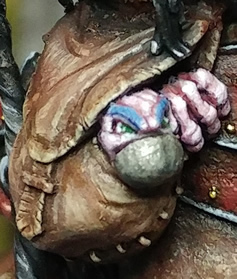 I wanted to leave this one zoomed in, just to demonstrate how I'm painting. You can see where I'm thinning the paints on the highlights from the transparencies. I'm not blending paint.. just thinning it so that as I layer, it tints. 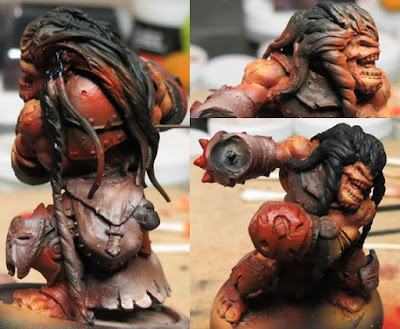 The shadows and leather look was created by using a couple brown washes before the first ones had dried. This provides a bit of a marbling look. I started with a gold that was more brown, but it wasn't bright enough for my tastes, so after painting his collar, I repainted it when his elbow armour looked so much better. Basically did some wet-blending here. Since I always thin with Liquitex Slow Dry while painting, I just used a little extra here. Then, while the paint was still wet, I continued with the following highlight layers. Like wood has a "grain", metal can too, so I made sure my brush was always moving vertically around the armour, not side to side. Once the paint had dried, I painted some final bright highlights that would stand out. 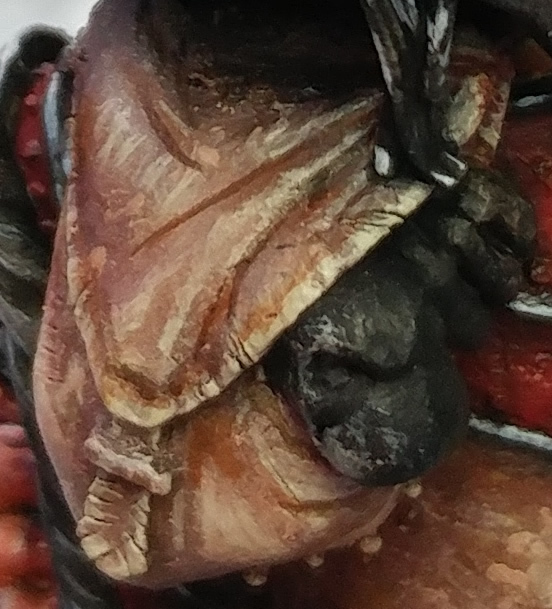 Remember, when wet blending, don't paint too large of an area, otherwise by the time you finish one layer, the part you started at will have begun drying too much. This means I painted his elbow, then the little circular bit, then his collar. Building greys on the black base. Made sure that highlight brush strokes were going top left to bottom right. Made sure that shade brush strokes were going bottom right to top left. In both cases, these strokes ended roughly in the middle. I'm seriously considering tearing this symbol off even though I've completed the model, right down to varnish. 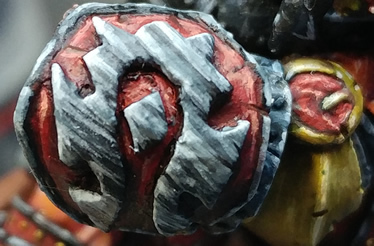 This would be a first for me, but I'm beginning to think about coming up with my own symbol to represent my Hordebloods... a mix between the Horde an Trollblood symbols. It would be a way to add my own touch to the army and comply with some of Privateer Press' regulations... thoughts? To build it, I cut off the spikes, smoothed some greenstuff over it, then once dry I drew the symbol on and cut it out. Painted up a little gnome-like creature, with a steel muzzle. Not much to say besides CRUNCH. So, I hated the way the axe kept turning out. Just didn't know what I wanted to do with the metal. Built up some layers of white to black with a sponge and hated it more, but it did add some interesting texture. So, I decided to throw some shades and highlights on it, just to see the form of what I'd created. Presto! Loved it, and pushed on from there. Adding more aggressive highlights all around it, then the gold NMM. Going to write a follow up post where I cover how I create his base and that's where I'll show off the final photos.